With a few traditional flour substitutes (including brown rice flour and tapioca flour), you can make homemade gluten-free bagels that will curb any future brunch meltdowns — for just 175 calories each! Sometimes you have to stop and smell the roses. Or the bagel. At least thatâs what Emmy RossumÂ is doing in thisÂ photo, which the actressÂ posted to InstagramÂ with a caption referencing her gluten allergy. âSometimes I miss gluten so much I just need to SMELL it. #allergic #glutenfree,â RossumÂ wrote. Anyone who canât/wonât/would rather not eat gluten might relate to the occasional craving for a soft, warm bagel (which especially hits when Sunday morning coffee, cream cheese and lox are involved!). Possible side effects include dizzily sniffing pastries, cakes and muffins. Luckily, thereâs a cure. With a few traditional flour substitutes (including brown rice flour and tapioca flour), you can makeÂ homemade gluten-free bagels that may just curb any future brunch meltdowns â for just 175 calories each, compared to anywhere from 270-340Â in a traditional carb-loaded bagel. Making these will also fill your kitchen with that heavenly just-baked smell.Â Go to townÂ with the recipe below, from cookbook Gluten-Free 101. 1. Dissolve the yeast and 1 tsp.Â sugar in the warm water and set aside, letting the yeast foam for about 5 minutes. Grease a 9Ã13-inch rimmed baking sheet or line with parchment paper. 2. In the bowl of a heavy-duty stand mixer, combine the yeast mixture, 1 tbsp. plus 2 tsp. of the remaining sugar, flour blend, potato starch, dry milk powder, salt, xanthan gum, guar gum, 1 tbsp. oil, egg and vinegar. Beat on low speed (using a regular beater, not the dough hook) just until blended. Increase the speed to medium-low and beat for 2 minutes, scraping down the sides of the bowl with a spatula if necessary. The dough will be stiff. 3. Divide the dough into eight equal portions. Generously dust each portion with rice flour; then shape into a ball. Flatten to a 3-inch circle, dust again with rice flour, and punch a hole in the center. Pull the dough gently away from the hole to form a 3-inch-diameter bagel with a 1-inch hole in the center. Place the shaped bagel on the baking sheet. 4. Place a rack in the lower third of the oven. Place the bagels in the cold oven. Set the temperature to 325 degrees and bake for 10 minutes. 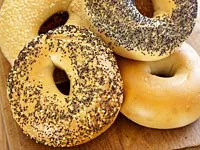 Remove the bagels from the oven, but leave them on the stovetopÂ and increase the oven temperature to 350 degrees. 5. Meanwhile, bring 3 inches of water, the remaining 1 tbsp. sugar, the baking soda, and the remaining 1 tbsp. oil to boil in a Dutch oven. Boil the bagels in batches for 30 seconds, drain them on paper towels, and return them to the baking sheet. Sprinkle with the poppy seeds, if using. 6. Return the baking sheet of bagels to the oven. Bake until the bagels are nicely browned, 25-30 minutes. 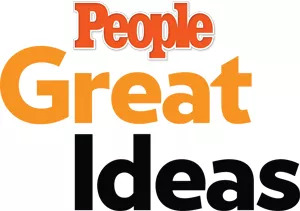 Cool the bagels on the baking sheet on a wire rack for 15 minutes. Transfer the bagels to the wire rack to cool for another 10 minutes. Serve slightly warm.